Kerala, Gujarat and Punjab show that states can play an important role in diaspora relations. States are maneuvering around foreign policy considerations by reaching out to Non Resident Indians (NRIs). Foreign Policy is considered the domain of the Union Government however, some state government have proved adept at working around this by focusing on selected areas of outreach. One of the primary ways that states play a role in foreign policy is by reaching out to diaspora. As NRIs are an important source of remittances to the states, the states benefit from solving the issues faced by NRIs. States are also better poised to engage with diaspora as they have direct links with them and can devote more resources than the Union to deal with issues. One of the ways in some which states have done this is by forming a public sector undertaking which can work with relatively more freedom than the state administration itself. More and more states have begun to institutionalise NRI relations through specific departments, divisions or boards. The states with the most developed institutional structures are Kerala, Punjab and Gujarat. These three states that stand out are not surprising given that they have huge diaspora spread out in different parts of the world. The states have tailormade their policies according to the interests of the diaspora which allows them flexibility and innovation. 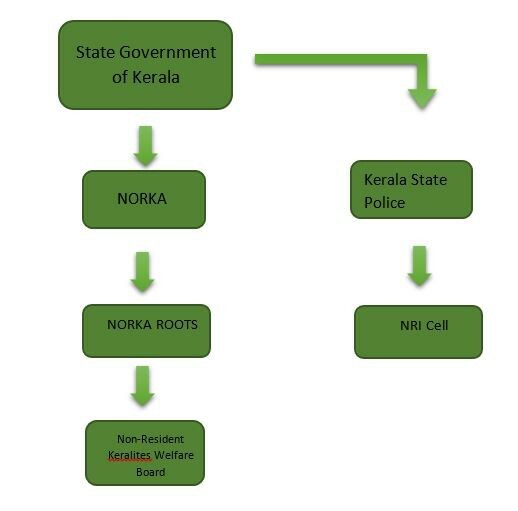 The State Government of Kerala has expressly looked at institutionalizing administrative processes with respect to the interest of non-resident Keralites (NRKS) through a department called Non-Resident Keralites’ Affairs Department (NORKA). However the real work is done by a PSU established under the Department called NORKA ROOTS. Kerala which receives the highest remittances in the country has been working on making its diaspora employable from arranging pre-departure orientations, easy authentication of certificates, skills upgradation programme, financial assistance, rehabilitation projects for returnees, job portal, travel assistance etc. 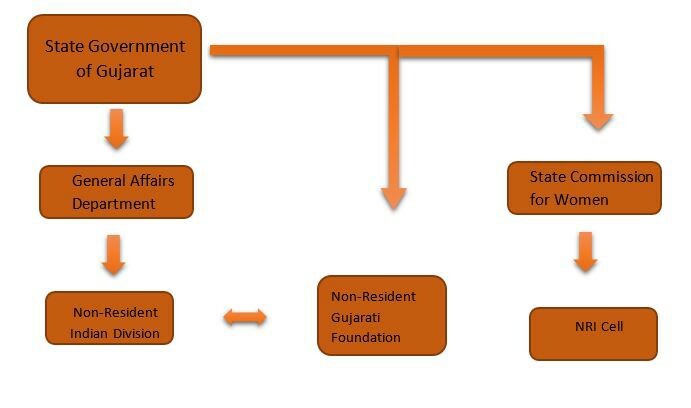 On the other hand Gujarat has set up an NRI division under the General Affairs Division which merely allocates funds and decides the composition of the Non-Resident Gujarati Foundation (A Government of Gujarat Undertaking). The NRGF looks at how NRIs can play a vital role within the state and has set up district committees for NRIs in every district to deal with any problems, to provide financial aid to the Gujarat Samaj, create a database of NRGs etc. 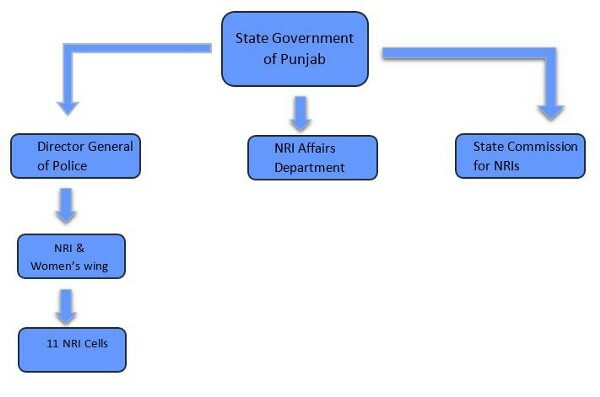 The NRI Affairs Department in Punjab has an intensive mandate from coordinating with the Home Ministry, liaising with NGOs, providing grants and waivers for NRI investment, focusing on twinning of cities such as Derby with Kapurthala and Jalandhar with the Borough of Hounslow, cultural exchanges etc. Punjab has gone a step further and allowed NRIs to vote in state elections (though they have to return to India to cast their votes). There are some common strands across the policies of these three states such as the outreach to diaspora, creation of databases, grievance addressal and encouraging investment. The state governments of Kerala and Punjab have set up NRI cells under the respective police (though for Punjab, this has been upgraded into an NRI wing with cells in every district). While Gujarat has not set up similar institutions, it has set up an NRI cell under the State Women’s Commission to deal with complaints related to harassment of women abroad. While the grievances of the NRIs generally fall under the Home Ministry, the states have ensured their own jurisdiction by making BRI grievances a law and order issue pertinent to the state. All the three states have also focused on issue identity cards to NRIs. The issue of cards such as Non-resident Keralite, Non-Resident Gujarati and Non-Resident Punjabi pushes for the sub-national identity which has generally subsumed under the larger Indian visa. This also reinforces the regional identity of the NRI and gives them a stake in the domestic affairs of the state. States working in diaspora relations is a crucial and overlooked part of foreign policy. Increasingly, states have started looking to their diaspora for several reasons. Even states with relatively smaller diaspora such as Madhya Pradesh and Uttar Pradesh have started engaging with diaspora so that they can be important stakeholders of the state. The role played by states in diaspora relations is an important one because it eases some of the burden that the Union bears in dealing with all these problems. It also acts as a bridging mechanism between NRIs and the Central Government. Other states in India should also consider similar mechanisms (or those more contextualized to its needs) so that they can tap into the advantages of their residents in a globalised world. This post is the first of a series of blogposts on ‘States in Foreign Policy’. The 22nd Conference of Parties (COP) to the UNFCC negotiations at Marrakech have barely been in the mainstream Indian news simply because it is hard to find the media space between the withdrawal of the Rs.500 and Rs.1000 notes and the U.S Presidential elections. The COP 22 negotiations were to represent the optimism of a hard fought climate deal and design the implementation strategy for the Paris Deal. However, they have been largely overshadowed in light of contemporary geopolitics. On November 4th, the outcome of the 2015 Paris negotiations came to fruition as 176 countries (the largest number to sign an international instrument since UNCLOS) deposited their instruments of signature at the United Nations. India had jumped on the bandwagon by ratifying the climate deal on the symbolic date of Gandhi Jayanti. Multilateral negotiations for the climate deal saw India change its stance from a disrupter to a norm follower- a stance it has echoed in other multilateral negotiations including nuclear proliferation and the WTO negotiations. India had resolutely refused to sign any climate deals that did not involve Western nations in pulling their weight. Indian diplomats had claimed that in order to allow their citizens dignity of life through economic development, they could not commit to energy cut back of the scale required and insisted that countries responsible for the emissions take the lead. However, this was not a viable position for long. Once China, the world’s largest contributor to carbon emissions joined with the US to cut down on emissions, India would have found its disruptive stance an even more unpopular and isolated position. India has shifted its stance and declared its Intended Nationally Determined Contributions (INDC). However India’s new stance also stresses on its reliance on the rest of the world in bridging its energy needs through technology and help. Over the last year, steps have also been taken within the country to support its stance at the COPs. By streamlining its civil aviation rules and signing the CFC cutdown treaty, India has shown its willingness in combating climate change. However, all of that now stands to change. The biggest shadow over the Marrakech COP is the US Presidential elections. While hyperbole has shown anti-Trump supporters protesting even at Marrakech, Donald Trump’s record on climate change shows little promise. He has repeatedly dismissed climate change and global warming as hoaxes and even gone on record to state that climate change was a conspiracy pioneered by the Chinese to reducing American manufacturing potential. Trump has stated that he would roll back the Paris Agreement. But speculation about Trump’s potential climate policy will lead us down a road that goes nowhere. The Paris Agreement was ratified by President Obama on the sidelines of the G20 summit. In a show of US-China alignment, leaders of both countries deposited the Paris deal together is Hangzhou. The Paris Agreement also does not allow countries to withdraw from it for a period of three years. Therefore, there is little danger of Trump rolling back the Paris deal. However, it is important to remember that INDCs are, at the end of the day, voluntary mechanisms based on good faith. They are non enforceable and bear little penalties in international law though the effects of climate change may seem apparent to everyone but Trump supporters. What is possible is that Trump will not prioritise the INDCs or fund the Clean Energy Plan, the brainchild of the Obama Administration. This is particularly important in terms of signalling for other countries. Countries like Saudi Arabia whose economies depend on conventional sources of energy could take the lethargy of the United States as a signal to disregard the Paris Deal. This would mean that the hard won negotiations of the last seven years have come to nought. Trump’s disregard for climate change will also stir the Chinese to take the lead on the issue. Already, Chinese officials have stated that they are committed to their climate change declarations despite political changes in other countries. China has also set up its national carbon emission trading market and has reportedly reduced its carbon intensity by 20% between 2011 and 2015. What does this mean for India? India directly faces the effects of climate change as much of its agriculture is contingent on the monsoons. It has shifted its stance from norm disrupter to norm follower as a way to break out of the climate chakravyuh. However, if the United States will not stick to its INDC and China will, which path will India choose? Several commentators are already questioning India’s stance considering its close ties with the US. However, a comprehensive definition of security would require India to stick to its INDCs as the country is vulnerable to the effects of climate change. India needs to exercise its strategic autonomy and continue with tackling its INDCs. Little attention is provided to India’s sea borders which are a huge source of vulnerability. Over the past years, efforts to secure India’s coasts have stepped up but are they adequate? As a peninsular country, India has a vast coastline of 7516 km making it vulnerable to various threats from the sea. However, coastal security is overlooked in our national security dialogue, which is overly continental in nature. The 1993 Mumbai blasts revealed that the explosives had been smuggled through the Raigad coast of Maharashtra. The 2008 Mumbai terrorist attacks also revealed loopholes in Indian coastal security. Smuggling of drugs and contraband, illegal unreported and unregulated fishing (IUU), and flow of migrants from neighbouring countries are other variables that underscore the need for coastal protection. Since Independence, India’s threats were seen as emanating from the land borders and little attention was devoted to the threats from the sea. Historically, India’s coastal states have a rich mercantile history whose routes remain unchanged. These also provide challenges emanating from smuggling, trafficking, illegal migration, infiltration and IUU fishing. The channels used for smuggling and trafficking are the same for security threats and terrorism. The Coast Guard was set up in 1977 for surveillance purposes and gradually undertook duties of protection and assistance of fishermen, anti-smuggling operations (in conjunction with other enforcement agencies), and preservation of marine life and ensures that maritime laws are enforced. The 1993 Mumbai blasts revealed that the explosives had been smuggled through the Raigad coast of Maharashtra. The Indian government’s attempts to resolve issues of coastal security started in the aftermath of the 1993 Mumbai blasts. It put in place a three tier structure which consisted of the Indian Navy, the Indian Coast Guard and a joint patrol comprised of personnel from the former two as well as from the state police, the customs department and other agencies. In 2005, the Government instituted the Coastal Security Scheme to set coastal police stations, check posts, outposts and barracks, equipped with boats, jeeps and motorcycles. The costs of training the personnel and procuring the vehicles were borne by the state while the Centre provided funds for the other operations. The reforms were not enough to deter the terrorists who perpetrated the 26/11 Mumbai terror attacks which exposed the loopholes in coastal security. In 2011, Phase-II of the scheme began; it allocated approximately Rs. 1579 crore to the states for procuring boats and vessels, jetties and four wheelers , surveillance equipment, computer systems etc. In 2012, an Automatic Identification System (AIS) was set up along the coast to monitor maritime traffic. The Navy created the Sagar Prahari Bal, a special cadre dedicated to Coastal Security comprising of more than a thousand personnel and a hundred fast interceptor aircrafts. In 2014, a permanent Joint Operations Centre was set up in order to coordinate between the various agencies. Since 2008, substantive efforts have been made to improve coastal security however, challenges, particularly those of co-ordination remain. The problems of coastal security remain varied and complex and the Coastal Security Scheme is just the first step in addressing these concerns. An important issue is consolidation of various stakeholders who include, the Indian Navy, the Coast Guard, the Marine Police, Customs Department, Fisheries Department, Special Economic Zones, Lighthouses, personnel of Critical Infrastructure, on the coast, fishermen and residents. Bureaucratic wrangling has also resulted in multiplicity of authorities from the Union, the states as well as private actors. However, centralising the authority under a single entity is not the answer because it leads to a hierarchical structure in which decisionmaking is long drawn while security threats require quick decisions. Coordination between these authorities is also a problem. For example, even though the Centre asked states to provide land and infrastructure to the Coast Guard in Kodibagh, the district administration remains reluctant to do so because of political pressure from the locals. Similarly, issuing of id cards to fishermen is an important issue but keeping track of the fishermen and those who lend boats or dhows to others has also proven to be a challenge. The establishment of marine police stations was thought to mitigate several of the on ground threats. However, the setting up of marine police stations has been slow because of states’ reluctance. In Odisha, for example, a CAG report discovered a shortage of manpower, lack of interceptor boats, no infrastructure and poor training of marine police personnel. This tussle between the states and the centre is a recurrent theme the debates on failing coastal security. States often cite the inadequacy of resources as one of the largest impediments to implementation of the coastal security initiatives. However, it is the states that bear the brunt of lapse of security, therefore, it is not an issue that can be allowed to rest lightly. One of the biggest challenges in coastal security is that of a free-rider problem. While all the stakeholders agree that coastal security is an extremely important issue, no one of them want to bear the expenses that arise. Pushpita Das argues that states prefer the creation of Central Marine Police Force as it will lessen the burden imposed on the state to provide manpower to the marine police. Indeed, the fiscal burden of coastal security is currently, ompletely being borne by the Central Government. The multi-stakeholder problems therefore, require a comprehensive understanding of the fiscal allocation behind various scheme and innovative solutions to the same. Another challenge is the role of technology in coastal security. Only after the Mumbai Attacks, there was a cognisance of the need to secure coasts at par with border outposts. Coastal radar systems, sensors and electronic surveillance systems have onlybeen installed over the last five years to monitor maritime traffic. In this light, there is a need to see how technology can be used innovatively in coastal security. The challenges to India’s coastal security are plenty. While terrorism has proven the most potent threat over the last few years, a whole range of issues ranging from migration to smuggling have plagued Indian coasts. The need of the hour is a comprehensive review of the vulnerabilities and threats arising from the sea. Only then, can successful solutions be sought. The EAS displays few concrete results and this is a problem that is symptomatic of most multilateral institutions in the Asia-Pacific region. The 11th East Asian Summit (EAS) concluded last week after adopting declarations related to infrastructure development, migratory flows and non proliferation. The Summit which brought together 18 Heads of State made headlines more for the bilateral meetings held rather than the outcomes of the summit itself. For example, Prime Minister Narendra Modi also attended the 14th ASEAN-India Summit and held meetings with Shinzo Abe, Barack Obama, Li Keqiang, Dmitry Mendvedev, Aung Sun Suu Ki, Park Geun-hye, Thongloun Sisoulith amongst others. India brought up issues of terrorism financing, the RCEP and India’s membership into APEC as well as India’s position on the South China Sea. However, there were few other takeaways. The evolution the EAS has been coloured by ineffectual meetings and bland rhetoric. The East Asian Summit has its roots in the regional institutionalism pioneered by the Association of South East Asian Nations (ASEAN) in the 1990s. At the end of the Cold War, ASEAN attempted to spearhead new security architecture for Asia. The basis for this was the ASEAN+ X format. In 1994, the ASEAN Regional Forum (ARF) was formed. In the aftermath of the Asian Financial Crisis, the ASEAN+3 included Japan, China and South Korea to catalyse the processes of regionalism. This expanded into the ASEAN+6 as it was widened to include Australia, New Zealand and India. Eventually, it admitted Russia and the United States and this grouping came to be known as the East Asia Summit (EAS). The EAS was to serve as the precursor for a larger East Asian Community built along the same lines as a European Community. One of the main contentions about the EAS during its formation was its membership. China was keen to limit membership to East Asian countries alone and was hesitant to allow India and Australia into the group for fears of dilution. However, membership continued to increase and the EAS is one of the avenues where leaders are brought to discuss issues of regional scope having wide ranging impact. Institutionalism in Asia has been weak and built with the explicit to keep it that way. Unlike the formal, majority decisionmaking structures illustrated by the European Union and other regional institutions elsewhere in the world, institutions in Asia prefer an informal, consensus based approach. The best example of this is the ASEAN whose style of negotiations have been described as ‘The ASEAN Way’. Supporters laud ASEAN’s processes while realists discard it as an effectual talkshop. While ASEAN’s merits and demerits as an organisation have been espoused and contested, it remains one of the few, functioning regional institutions in Asia. Multilateralism in the Asia-Pacific region has not been successful either in the economic or the security spheres. One reason is the lack of desire of states, who are generally suspicious of regimes that would take away their strategic autonomy. However, the excessive focus on inclusivity and soft regionalism, dialogue and consensus mean that the EAS currently agrees on very little. Characterised by geopolitics and rising contentions in the Asia-Pacific, the loopholes of institutions in fostering cooperation is becoming more apparent than ever. Meanwhile, multilateral institutions allow for corridor diplomacy and declarations of commitment. How far this will go in socialising countries into regional or global norms is yet to be seen. The G-20 Summit this weekend will see world leaders descend upon Hangzhou. How much will be accomplished considering the G-20 has been meandering since 2010? Over the last few months, Chinese media has depicted the G-20 Hangzhou Summit as a major upcoming milestone in global governance. Media Reports claim that the Summit’s agenda includes issues ranging from global taxation, innovation, growth, investment, climate change, trade barriers to even anti-corruption. How much will the G-20 be able to deliver on? It will do us well to question what the G-20 has actually achieved in the last six years. It was the primary coordinating agency after the 2008 Financial Crisis and came up with the standstill policy. At the 2010 Seoul Summit, there was a 6% quota rebalancing to emerging countries in the composition of the executive board of the IMF. The 2011 and 2012 Summits were overshadowed by the Eurozone Crisis. At the Cannes Summit, it was suggested that the IMF would provide additional financing to Europe as a whole rather than a single country. Japan led the pack with 60 billion dollars while the BRICS countries followed suit but the US remained aloof from the efforts. In 2013, the G-20 for the first time, addressed political contentions, particularly the Syrian civil war and the use of chemical weapons. In 2014, the Brisbane Summit saw leaders pledge to lift GDP by 2% by 2018. However, there is little evidence to prove that most countries are departing from their national policies to meet their commitments. The 2015 Agenda simply reiterated the need for meeting past commitments. Thus, broadening of its agenda beyond international financial reform has also meant that the G-20 has had little impact on anything. The counter argument is that the G20 is a deliberative body rather than a decision making one. However, the purpose of deliberations is to drive decisionmaking at some level. The G-20 always possessed a feature of complementarity: it was to work alongside other major international institutions. However, reform of international institutions has proven to be a long arduous task and the G-20’s assumption of other tasks (comparable to the agenda of multiple other international institutions) will bear little fruit. The main problem with the G-20 is that it is unable to deal with the power politics amongst its members. Given the unanimity requirement in the organisation, an issue is pushed off the agenda if there is a considerable opposition from several G-20 members forming an issue specific coalition. Agenda Setting dynamics within the G-20 generally pit developing and developed countries against each other. On the other hand, China which is the global growth engine and the US, still the global superpower, both seek to dominate the G-20 agenda. This is addition to individual countries attempting to carve out special deals for themselves. This cacophony of voices is one of the reasons that the G-20 has failed to deliver. The G-20 is important for corridor diplomacy however, G-20’s importance boiling down to corridor diplomacy cannot be regarded as a success in any sense of the term. The main problem with the G-20 was that it was a minilateral envisioned to have taken the most important powers into consideration for effective deliberation. However, this minilateral is not small enough to align nations’ strategies and is beset by concerns of national interest. The 2016 G-20 agenda is too wide a net for any effective outcomes. The only way forward is for the G-20 to prioritise its most important issues and stick to its original mandate: answering systemic economic challenges. An analysis of India’s positioning towards various Multilateral Export Control Regimes displays a trend of norm creation- norm adherence and agenda setting. India has low reserves of uranium required for its civil nuclear energy programmes. While India has been attempting self reliance in the field by substituting thorium as the primary nuclear fuel in its three stage nuclear cycle, it still suffers from lack of uranium in its reactors. India would also benefit from nuclear technology that it did not have access to during the Cold War because of its isolated road to self sufficiency. India did not sign the Nuclear Non Proliferation Treaty (NPT) and detonated a nuclear device, ‘Peaceful Nuclear Explosion’ outside the NPT norms in 1974. Restitution was quick as the London Club (which then became the Nuclear Suppliers Group) was formed in order to restrict nuclear supply only to countries that have signed the NPT. India relied on indigenously built nuclear facilities for the next three decades until it tested its nuclear device in 1998. India faced harsh criticism for the tests and countries like Japan and the United States even imposed sanctions on the country. However, the world’s opposition to India’s nuclear stance was to change. In 2005, the US-India Civil Nuclear Deal was a pathbreaking deal as it changed the US approach towards India’s nuclear programme. This was instrumental in providing India with an NSG waiver in 2008. India was to be considered a defacto nuclear power and allowed to trade with the Nuclear Suppliers Group. In 2010, the Indo-US Joint Statement outlined India’s case for multilateral export control regimes (MECRs). Since then, India has taken intensive efforts to synchronise its export control mechanism with those of different regimes. While the MECRs all focus on curtailing the supply of sensitive technology, India has focused on improving its own proliferation record, by streamlining its export controls with those of various international regimes. The Foreign Trade (Development and Regulation) Act No. 22 of 1992 or FTDR is the principal legal basis for India’s strategic trade control system. The Indian government uses its own export control list known as the Special Chemicals, Organisms, Materials, Equipment, and Technologies (SCOMET) list. It has also identified some groups as being more important than others: Currently, the diplomatic efforts are geared towards the NSG and the MTCR because entry into the Wassenaar Arrangement and the Australia Group both hold entry into the former groups as a precursor. India’s Position Applied to NSG on May 10, 2016. India has been keenest on NSG membership because the 48 member group contains supply of nuclear fuel. The NSG was formed in the aftermath of the Indian Peaceful Nuclear Explosion in 1974, and was one of the instruments used to isolate India in the nuclear domain. In 2008, it did provide India a clean waiver to allow it to engage in nuclear commerce. However in 2011, the NSG went back on its 2008 India- specific waiver by instituting new guidelines. The implications of the new guidelines are that it has made the Nuclear Non-Proliferation Treaty (NPT) even stronger and wants India to join the Treaty. India’s membership to the NSG is thus important because it allows India to be a part of future norm making in the nuclear domain. As geopolitics always trumps international law, it is possible that the rules of the group can be changed in the future. By being within the rulemaking mechanism, India can ensure that the norms are aligned with its national interests. The main benefit of the MTCR is that it controls missile technology, particularly drone technology that India could potentially gain access to. India’s Brahmos missile, made in conjunction with Russia has a range of 290 km, just under the limit of the MTCR. In the 1990s, the MTCR had protested against the sale of Russian cryogenic engines to India as it supposedly flouted group norms (Russia was a part of the MTCR) and put political pressure until the sale was dropped. Joining the MTCR could prevent similar political pressure against technology transfer. However, an important caveat is that missile technology transfer does not depend on the MTCR alone. Member Countries have traded despite flouting MTCR norms as they are voluntary and non-conforming. Therefore, India does not necessarily need to be part of it to conduct trade but it does add to its political capital. Members of the Wassenaar Arrangement have to maintain rigorous national export control systems and have to be members of or be acting in accordance with the NPT, MTCR, CWC, and the UN Register of Conventional Arms. While the group is said to be easier to gain membership than some of the other export control regimes, India is looking to gain membership only after it gains entry into the NSG and the MTCR. India has been streamlining its SCOMET list, its FTDR and also passed the WMD Act in 2005. Membership in the Wassenaar Arrangement presents one less political hurdle in getting access to sensitive technology. It is important for India’s soft power to be seen as a responsible exporter of technology. The Australia Group looks at harmonization of international export controls on chemical weapons precursor chemicals. As India’s chemical and biotechnology industries grow in size and stature, being a member of the Australia Group would provide India’s commercial ventures with political legitimacy as well. However, it has few other benefits. While India was an integral part of negotiations on the Arms Trade Treaty, it did not sign the treaty because India’s sovereign right to trade in arms could be impinged by the regime. It also wanted stronger action on illegal arms trade. It also contends that the ATT limits itself to arms sales rather than transfers which creates an inherent loophole for countries to take advantage of. India is the largest importer of arms in the world and is thus, any treaty on arms trade need to take the country into consideration. Illicit arms trade, particularly in the neighbourhood is a worrying factor and the Arms Trade treaty is an important step in regulating it. However, unless the Treaty is made stronger in essence, it will not be in India’s national interest to sign it. India has been an active proponent of the CWC and in 2009, it became the third country to destroy its stockpile of chemical weapons. While India has been accused by Pakistan of using chemical weapons, the accusations did not bear fruit. Indeed, India’s chemical industry is expansive and India has demonstrated its intent to be a part of counter proliferation of chemical weapons by aiding the Organisation for the Prohibition of Chemical Weapons. An analysis of India’s participation at various multilateral export control regimes shows India’s proactive efforts in being perceived as a responsible nuclear player. India has been an integral part of the norm creation process by participating in negotiations. However, it does not enter into treaties or join organisations which do not comply with its core interests such as the Arms Trade Treaty. On the other hand, even if India lies outside the regimes, it has followed international norms either by passing domestic laws such as the WMD Act of 2005 or setting up its SCOMET. Now, India is using its position to be join regimes which will provide it a seat at the agenda setting table. In this way, it will make sure that the norm making mechanisms in the future will be in conjunction with India’s national interests.